JBS has his headquarter locate in San Paulo. The major business activity is producing fresh meat & pork & chicken in Brazil, America, Argentina and Australia . It was listed in San Paulo security market. In 2007, Brazil buy Swift & Company for 225 million USD, which is one of the largest food supplier in America. JBS also buy Agroveneto to enlarge the market share in Brazil. JBS is also a leading supplier of leather. They export a lot of leather to make shoes in Italy and China. They also manufacture chemical products to make leather in Brazil. 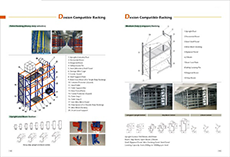 Recently one of their chemical group need pallet racking system. The purchase manager learn our name from their friends. They send us the rough idea and warehouse drawing by email. After got their email, our engineer check the warehouse size & cargo condition quickly and give them a rough idea of how to place warehouse layout drawing. After get our quick reply, the warehouse manager of JBS was impressed by our professional job. They study our proposal carefully and reply very quickly. The pallet racking is used for chemical product storage. Thus customer have special requirement for corruption resistance. Customer ask the racking to be galvanized then powder coating. This was a special treatment especially for chemical storage. T Racking used to do such treatment for other customers. Galvanized parts plus powder coating can protect the racking system from rusty from chemical corruption. T Racking then send the technical detail of galvanizing and powder coating to customers quickly. After get the technical report, customer was very happy with the report then ask T Racking to offer a accurate for the project. Although the project have special treatment for galvanizing + powder coating, the cost was not very high as T Racking get very competitive steel price and control the tooling cost. After customer compare the cost with other supplier, customer found our price was very competitive. Customer then choose T Racking happily. Attached pictures of galvanized racking after powder coating.